59,849 residents in Charlotte are foreign born. That’s over 10% of the population. 132,958 individuals in Charlotte over five years old speak a language other than English at home. 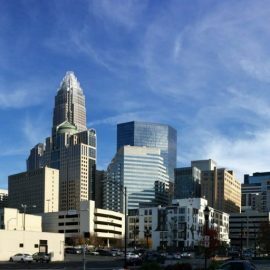 There are more than 850 foreign-owned companies in Charlotte, representing 42 different countries. There are over 300 international organizations currently active in the Charlotte region, hosting over 90 international festivals annually. Over 12,000 students who speak 160 different languages and represent 160 different countries attend Charlotte-Mecklenburg Schools. In 2000, 55.1% of Charlotte’s population was white. By 2009, that percentage decreased to 47.9% due to a large increase in the Hispanic and Asian population in Charlotte. 48,240 foreign born individuals have entered Charlotte since 2000. Of the total immigrant population in North Carolina, 31.1 percent entered during the 1990s, and 45.7 percent entered in 2000 or later. In 1999, CMS had 2,405 students enrolled in ESL classes. By 2010, that number had increased to 10,339. Though much of Charlotte’s ethnic diversity is spread across the city, there are a few major concentrations of ethnically diverse communities. Perhaps most diverse is Charlotte’s Eastside along Central Avenue and Albemarle Road. Zip code 28205 contains this part of Charlotte. 8,068 residents in 28205 are foreign born. That’s almost 20% of the population. 5,163 of those residents entered 28205 since 2000. 23.8% of the residents in 28205 speak a language other than English at home. One way to figure where various ethnic communities are concentrated is to map out ethnic locations such as restaurants, markets, salons, or worship centers. Visiting these various ethnic locations is a great chance to find men and women of different ethnicities gathered in one place, providing opportunities to learn more and to engage individuals with the gospel. Below is a map of almost 500 ethnic locations in Charlotte. The database from which this map was created certainly does not provide an exhaustive list of ethnic locations, but it at least provides a small picture of ethnic locations in Charlotte. When looking at the map, you’ll notice three particular trends of concentration. First, you’ll notice a concentration of ethnic locations up North Tryon and around the University Area. Second, you’ll notice a concentration of ethnic locations on the Eastside, along Central Avenue, Albemarle Road, and all the way down Independence. Third, you’ll notice a concentration of ethnic locations down along South Boulevard. Another way to learn about diversity in Charlotte is through the U.S. Census Bureau. Using U.S. Census Bureau resources, we’ve created maps which should help visualize ethnic diversity in Charlotte. One way to figure out where non-Americans are residing is through looking at statistics on a city’s foreign born population. 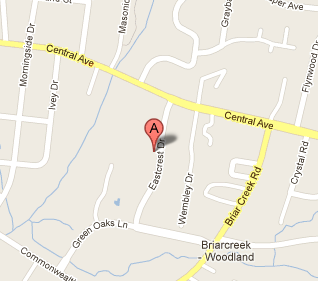 Below is a map of Mecklenburg County divided into Census Tract. Red represents higher populations of foreign born residents. Blue represents lower populations. Another way to see where non-Americans are residing is through looking at statistics on the language spoken at home in households across the city. Below is a map of Mecklenburg County divided into Census Tract. Red represents higher percentages of homes in which a language other than English is spoken. Blue represents a lower percentage of homes in which a language other than English is spoken. To discern which nationalities are highly represented in a geographic area, we can examine the country of origin for the foreign born population with in a geographic region. Below is a list of statistics on the foreign born population in Charlotte from the U.S. Census Bureau, 2008-2010 American Community Survey (ACS). Click on an individual country or region to view a map of its population in Charlotte by census tract. You’ll notice that the population of several countries is concentrated in two or three census tracts in Charlotte. *Congo and Uganda are not listed in the ACS table. Both countries, however, have significant refugee populations in Charlotte. *Bhutan and Nepal are not listed in the ACS table. However, the Nepali-Bhutanese refugees (groups which fled from Bhutan in the early 90s and have come to the U.S. from refugee camps in Nepal) have a population over 1,000 in Charlotte. This population has only been coming to Charlotte since 2008, thus they are not well represented in the 2008-2010 survey. *The ACS table estimates 168 individuals from Burma. That number is far too low for present-day Charlotte given the recent arrival of many familis from Myanmar. Click here to view the full ACS table from which the above statistics were drawn. To learn more about the demographics of the Charlotte area, take advantage of the resources the U.S. Census Bureau has made available. At their website, you can look up data for race, languages, foreign born residents, etc. on various geographic units. 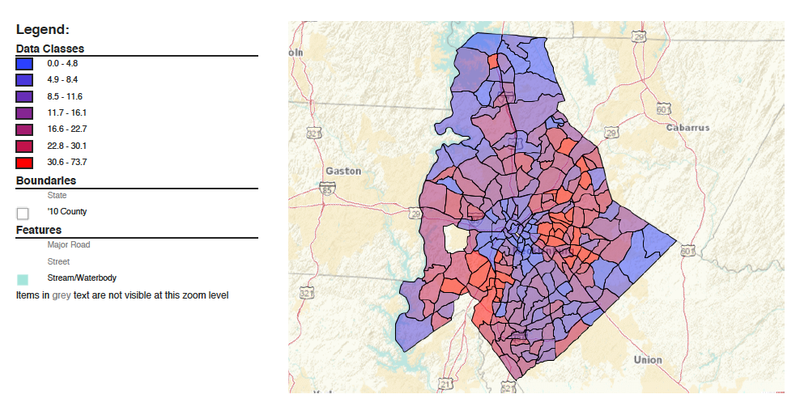 You can also make maps like the ones above in order to visualize the census data. To gain a better understanding of the diversity around the eastbound Central Avenue corridor, one international outreach worker performed a language survey of Mountcrest Apartments on Eastcrest Drive off of Central Avenue. Over all, twelve different languages were being spoken in the homes of this one apartment complex. Out of the 110 occupied apartments, 102 of them used a language other than English at home. 8 homes spoke Jarai, the dialect of a Montagnard people group from Vietnam. Other languages spoken included Vietnamese, Benahr (a dialect of a Montagnard people group from Vietnam), Urdu, Somali, Tigrinya (the official language of Eritrea) Kunama (a dialect of a people from Eritrea), and Tagalog.